Get the Full StoryYou could call me a primer enthusiast. As an editor, I'm on a never-ending quest to find the best, newest formulas that truly do what they're supposed to: fill pores, blur imperfections, and keep my makeup in place all day long. 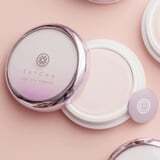 That's why I was intrigued when my friend, a fellow beauty-lover, insisted that I give the Tatcha Silk Canvas Protective Primer 52 a try. After just one application, I became totally hooked; my other favorites are now pushed toward the back of my vanity. This primer is quite unique; it comes in a pot instead of a bottle. The formula is a thick, balm-like consistency and you use a small disk to scrape your desired amount out of the pot. What first captured my attention was the incredible scent - the floral notes are pretty enough to be a perfume. The velvety consistency melts into your face the moment you apply it; it's hydrating and sleek without feeling greasy. What makes it so satiny? Thin layers of silk smooth fine lines and keep you looking fresh. Even before I apply my foundation, I can see a huge improvement in my complexion. What truly impresses me is how well this primer keeps my makeup in place; my foundation and cover-up look perfect from morning till night. I never have to reapply. I can honestly say this product is worth the money. The pot last for months and months so you won't be running out quickly. If you're in the market for a new primer, I'm begging you to give this one a try.